Rafael Finishes Inks on Book 3! « GIANTS BEWARE! DRAGONS BEWARE! Home » Uncategorized » Rafael Finishes Inks on Book 3! Rafael Finishes Inks on Book 3! JORGE: Congratulations, Raf! So let’s see, it’s been about a year since you started inking the roughs of Book 3. How does it feel? (Ed Note: Rafael does a rough version of the book then goes back and to re-draw every single line). still needs to do the colors, and I need to do the cover. JORGE: Making a graphic novel is like competing in a triathlon, huh? RAFAEL: Yeah, I made it through the swimming part, but we still need to do the long-distance running and ride a bike up the mountain before the Finish Line. JORGE: So completing something so massive like inking a whole graphic novel, it sounds like it’s a mixed bag? RAFAEL: Right. I feel a great sense of relief. I’ve been working on it non-stop for a year. I was doing my regular TV animation work during the day and then nights, weekends, any spare time I can steal, I would ink our book. But now that I’m done it’s like there’s a big gaping hole in my life. I feel like I almost don’t know what to do myself right now. I think I’m going to need to find another project to fill this creative hole. JORGE: How many pages did you ink? RAFAEL: I don’t ink in the traditional sense with pen and paper. I do digital inking in Photoshop. I inked 157 pages for this book, which was the same amount of pages I did for Book 2, DRAGONS BEWARE. JORGE: Which of the three books was the hardest to ink and which one was the easiest? RAFAEL: Well, each book presented its own challenges. With the first book, GIANTS BEWARE, it was the first time I’d ever done digital inking using Photoshop in a project that massive. It took me awhile to get used doing it that way, but I liked the results. 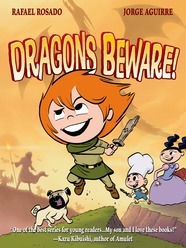 Book 2, DRAGONS BEWARE, was challenging because of the scope and amount of characters and environments. Book 3, MONSTERS BEWARE was the easiest because I was used to drawing these characters, environments, and I used a whole new set of digital brushes that felt closest to pen and ink. JORGE: Enjoy your nap, Raf! Rafael gets encouragement from his daughter. By Jorge in Uncategorized on September 8, 2016 .